To use it properly, the Bowflex TreadClimber TC10 takes a lot of concentration and that will take away from the casual enjoyment of exercising on a treadmill. It also adds to your stress to have all your attention on properly making every step. The backlit LCD display shows four readouts for Speed, Distance, Time, and Calories. It also features goal-oriented technology called the G.O. Coach™. This displays the user’s weekly progress and workout goals. UPDATE: Bowflex has introduced all new models to replace the TC10, TC20 and the other older TreadClimbers. 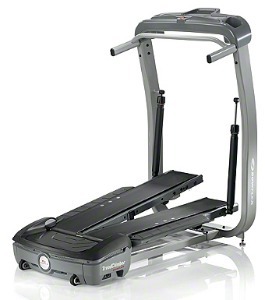 The Bowflex TC10 has self-adjusting dual treadles that let you use the machines as a treadmill, or as a stairclimber with a more dedicating stepping motion, or doing a stride that resembles an elliptical motion. However, walking on one of these treadclimbers is not as easy as it sounds. The treadles self-correct so the user must concentrate on each and every step to avoid falling. You can lock the treadles together and use it as a treadmill, but even then you have to keep your feet wide apart to balance your weight on each treadle. That kind of awkward straddling walk isn’t good for your hips, and should give you an idea of how odd this machine can feel to shorter users. On the plus side, the Bowflex TreadClimber TC10 will save you a ton of money over the pricier TC20 model, which offers a 4.5mph top treadles speed, two user profiles, heart rate monitoring, and an extra year of the warranty. Since none of those features are worth spending an additional $1,100 to get the TC20, the TC10 is the better deal in that it offers the same type of workout on a slightly smaller machine. For the most part, user reviews of these tread climbers have not been kind. These types of “treadmills” have far more mechanical problems because they have two, not one, tread belts, plus other complexity issues such as the independent hydraulics shocks. Not only are these machines not durable and tend to break down within a year with average use, the customer service from Bowflex is not something you’ll want to deal with. At $2,199, the Bowflex TreadClimber TC10 is over-rated and poorly designed. You can get a great treadmill for that amount of money so we recommend you forget the hype on these machines and go for a proven treadmill with a nice 15% incline, speed up to 12 mph, and tons of cool features. Will a real treadmill, you won’t constantly be looking at your feet trying not to step on the treadle sides. We recommend that if you want an elliptical, buy one, but if you want a big incline treadmill, you’ll find better options than these over-priced tread climbers.